Shirashima-zaki, Shirashima, Okinoshima, and other small islands stretching directly north are collectively called the Shirashima Coast. The vivid colors of the white rocky islands in the emerald green sea woven together with the fresh green of the trees provides a soothing sight to visitors. Along the walking track to the lookout, see mysterious sights, such as a mixture of northern, southern, and continental plants, as well as brightly-colored hydrangea in bloom till December. 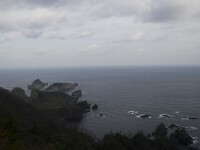 Nishimura, Okinoshima-cho, Oki-gun, Shimane Prefecture"